As with most Luftwaffe '46 project aircraft, only a smattering of information is available. This was a design based around the 4,000 hp Argus AS-413 engine and submitted as part of the RLM Specification 21-07-44. It was to be an all-weather high altitude fighter where the engine drove contra rotating props at the back of the fuselage. It had a rather unique swept forward tail plane assembly that attached to the rear of swept back wings. 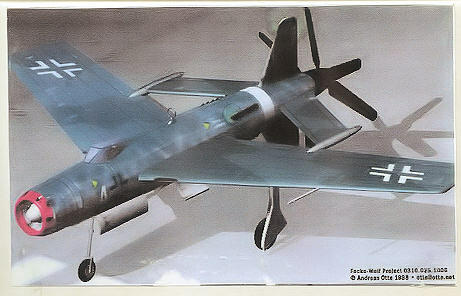 Like the Do-335, it would have had upper and lower vertical stabilizers and very stalky landing gear. Armament was all in the nose with 2 30mm and 2 20mm cannon. Projected top speed was 820 kph. Upon opening an very familiar looking box, I found a compartmented plastic bag, instructions and decals along with two vacuformed canopies. The molding on this looks very much like it was produced by Anigrand (which it is), a company with which I am quite familiar. 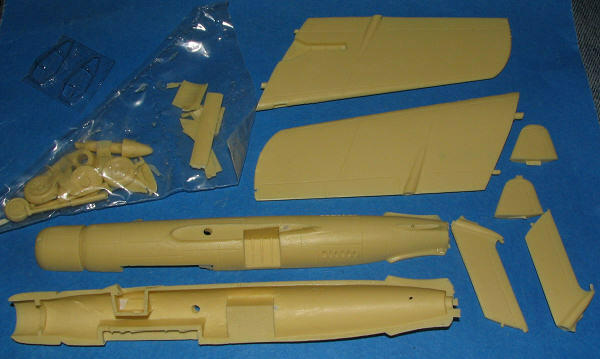 Same somewhat deep engraved panel lines, same minor molding glitches like a few air pockets on wing tips and interior sections, nearly transparent rear gear wall on one fuselage half, and some detritus that is attached to a tiny section of rear fuselage. Nothing that some work with superglue and filler and sandpaper can't take care of and something I've taken in stride. Some of the exhaust areas have resin fill that will have to be very carefully scraped out. I should also point out that the kit fuselage is a lot beefier than the CG box art shows. Props are shorter too as the ones on the box art would seem to hit the ground! There are also the usual bits of pour stub to remove, though only remnants as the biggies are already removed. A real good idea is having the nose wheel molded in with the nose strut. Considering the amount of weight you'll need to keep this off its tail (and thereby not breaking prop blades), a separate, thin, half forked strut would deform under the weight in only a few months. I know as I have a couple kits that this has happened to. Though it may sound like a lot of work to prep, we who are attracted to these things soon learn how to take care of the small glitches, and after just a few kits, it all becomes very routine. Did I mention two vac canopies? Not only is it nice to have two of them, but these have well defined frame lines, making masking so nice and easy. My thanks for this thoughtfulness. There is also a generic sheet of decals (not shown) with several varieties of insignia and a set of swastikas. They are about the right size for a kit of this size, though if you want other sizes, there are lots of aftermarket available. Instructions are a bit unusual. There is a sheet with a three-view and short history. Then, stapled to it are several inkjet printed color photos of the kit in various stages of construction. Actually, this works out quite well and besides, these kits are not ultra complex as they come in the box. No painting or markings information is given. This is Luft '46 and aside from the usual RLM 66 interior and RLM 02 wheel wells, the rest is totally up to you. Some might wonder if this is a repop of the Sharkit kit of this plane from many years ago. I have been assured and can see for myself that this is not the case. It is a new mold. Frankly, I find kits like this to be a real delight. Sure, they are not for everyone and they do take some skills to complete, but then, you don't want to add to the mass of P-51s, Bf-109s, Spitfires and A6Ms that seem to dominate the model world, do you. If you like the subject and are ready to go beyond mere assembling, give it a go. One thing for sure, this will be something that none of your modeling buddies will have! My thanks to Cape Hobby and Gift for the review kit. This is only available from them so visit and see what else they have to offer.